In the twisted growth on the outskirts of Arkham to the darkened angles in the very corner of withered homes lies a vast menagerie of evil waiting to be summoned! 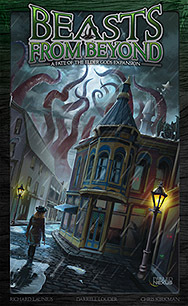 With The Beasts from Beyond expansion for Fate of the Elder Gods, your Cult will use new Spells to make some of the most classic creatures from Lovercraftian lore do your bidding. Bring forth the mysterious Mi-Go, the Dark Young, Deep Ones, Byakhees, Goat Spawn, Hunting Horror, a Hound of Tindalos, or even the terrifyingly unpredictable shoggoth. Players will also get a chance to summon four new Elder Gods - Shub-Niggurath, Ghatanothoa, Dagon, and Yig.